SONGS ALONG A STONY ROAD follows musicologist Zoltán Kallós on his visits to musicians in villages around Transylvania and Romanian Moldavia. In each village Kallós is a welcome distraction from the backbreaking manual labor of farming, and he easily coaxes the citizens to break out a bottle of homemade brandy and sing an old song, or dust off the violin and play. He has collected music in these places for half a century. 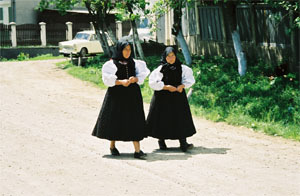 Transylvania and Moldavia are lands where several ethnic groups have lived in adjacent villages for centuries. Their music reflects these proximities, and is unique because of the constant crossover between styles and cultures. For musicologists and ethnographers, it is a treasure trove as rich and diverse as any to be found in Europe. The 20th century’s most renowned Hungarian composers, Béla Bartók and Zoltán Kodály , developed their musical ideas by traipsing from village to village and collecting the folk songs, either in hand-notation or with the earliest recording tools available at the beginning of the last century. Their own work profited from the uniqueness of the music they found. While these composers are now household names, the folk traditions in music that inspired their work are less well known. Under the long rule of Romania’s communist dictator Nicolae Ceausescu, the ethnic diversity of Transylvania was a non-subject, and western musicologists had little access to the villages where traditional music of any kind could be heard, be it in Romanian, Hungarian, or Romany. In many places, particularly among the Csángó people of the Gyimes Mountains and Romanian Moldavia, the folk songs and the music itself might well have been forgotten; unusual musical instruments, like the furuja (a wooden flute), and the gárdon (a cello used as a rhythm instrument by hitting the strings with a wooden stick) might easily have disappeared, along with the knowledge of how and what to play. That the music is alive today is largely due to the efforts of one man. Zoltán Kallós, of (Rascruci) Válaszút and (Cluj) Kolozsvár, Romania, is an international treasure, knowing thousands of songs and their lyrics by heart. For over 60 years Kallós has notated and collected the music and folklore of his native land, gaining intimate knowledge of the remotest villages. He has published volumes of notations and lyrics, and released many of his own recordings. Cassettes and CDs he recorded are also available on the Fonó label in Hungary. The older singers, violinists, and flute players in Kallós’s world are a thinning breed. Following the end of the Ceausescu dictatorship, Romania opened up to the world, and villages that only a decade earlier were without even a single radio, now are dotted with satellite TV dishes. Young people exposed to the latest pop music are less interested in the music of their grandparents. Indeed, they are leaving home in growing numbers, to seek education and employment in countries to the west. In another decade the handful of village musicians and singers who still know the old ballads and laments will be gone, and no one but the young people trained by Zoltán Kallós at his music camps can replace them. Songs Along A Stony Road is a search for a way to depict and preserve pieces of a vanishing heritage. The people, music, and even the regional dialects in the film, are fast receding into the past. Our hope is to capture some of this tradtion for posterity. The 70-minute film was compiled from sequences videotaped during five expeditions undertaken between 1999 and 2006. Everyone in the film is either from the Magyar-speaking villages of Transylvania or from two of the regions inhabited by Csángó people: the valleys of the Gyimes Mountains and the Csángó villages sprinkled along the rolling eastern foothills of the Carpathians in Romania’s Moldavia. Válaszút (Rascruci), near Transylvania’s capital Cluj, is where Zoltán Kallós displays some of the treasures from his vast collection of Transylvanian folk artifacts. The scene allows us to glimpse the enormous effort he has expended in preserving the culture of his homeland. Kallós discusses his musical collecting and the difficulties he faced under communist rule when anyone interested in traditional or folk arts was considered a nationalist and constantly subject to persecution. 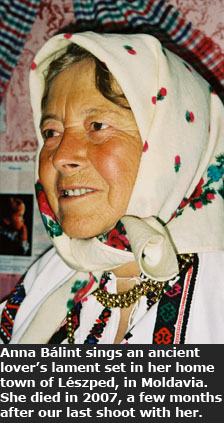 The singer Kallós has known longer than any other is Erzsi Papp, a widow who lives in Magyarszovát (Suatu). Erzsi was a 16-year-old serving girl at the refectory of the boarding school Kallós attended when they met in 1943. Within a year he started listening to her strange pentatonic laments and collecting them. On our last visit to Erzsi she imparted a peculiar dream that portended our arrival. At Magyarvista (Vistea) Erzsébet Erdei talks about her youth, a time when she was recruited as a folk dancer by Kallós, but was not allowed to travel to performances by an older jealous husband. She sings of her own sorrows for having been rejected by her lover for a wealthier girl. 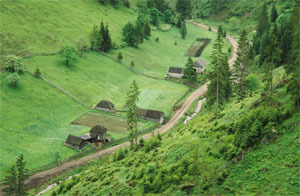 Scenes of the Palatka band performing at Válaszút in 2002 are intercut with transitional scenes of village and rural life as the film moves east from the center of Transylvania to its eastern edges in the Gyimes Mountains. 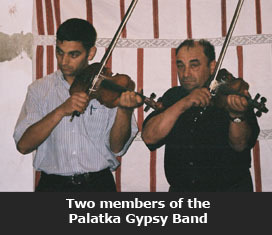 Two of Transylvania’s most renowned fiddlers live within a few hundred yards of one another in a Gyimes valley. 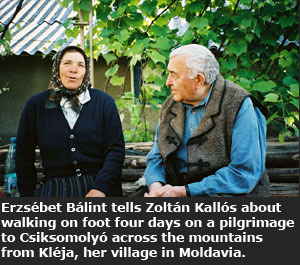 János Zerkula and his wife Regina Fikó, who accompanies him on the gárdon, are neighbors with Zolti Antal. Both fiddlers are blind, but this does not stop them from exposing their formidable talents as they show off the region’s unique musical style, spicing it up with stories about their lives. 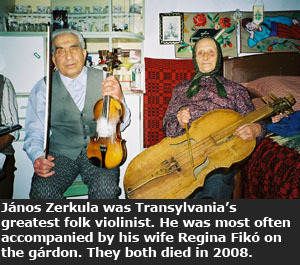 Zerkula and Fikó both died in 2008. 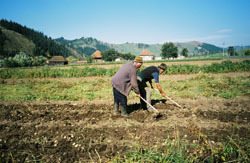 The living reality of back-breaking manual agricultural work is illustrated in a number of sequences shot in the Gyimes area. In one of the picturesque valleys of the Gyimes Mountains we meet the Sinka family as they harvest potatoes in a churchyard—their due from the church as official parish bellringers. But some graves lie outside the churchyard fence, and the Sinkas are baffled that they must explain that these are the graves of suicides who cannot be buried in hallowed ground. A grape harvest at the top of a hill in Somoska, Moldavia introduces us to the easternmost Csángós who speak the most archaic form of Hungarian. These hard-working villagers are proud of their Csángó heritage, but the women admit to knowing very few of the folk songs their parents taught them. They sing a children’s ditty, and an ancient love song as they work. The twin villages of Somoska and Kléja happen to be the domicile of the most renowned flute player in all of eastern Europe—László István Legedi. He performs on a variety of instruments, including the flute and the tilinka, while explaining how he learned to play on his father’s knee. In another scene he guides us through his father’s house and we see the small room he has turned into a classroom for teaching his music and Hungarian traditions to the Csángó children of Somoska and Kléja. Standing on the balcony he points out where he listened and learned his first melodies from the shepherds on the hill nearby. Legedi, a true virtuoso, leaves the impression that he will do his utmost to stem the tide of globalized culture, and transmit his musical heritage to the next generation. In Lészped, a few miles north of Somoska, we meet Anna Puskás Bálint through a ballad she sang during our 2001 research expedition. The blue walls of her house, and her carefully arranged ceremonial costume, are testament to her lifelong efforts at cultural preservation. As the film ends, we see Bálint in 2006, a much more feeble woman a few months before her death, as she struggles with a lament, searching for the melody of a song she has not sung for a long time. Our research began in 1999 with a trip to the Gyimes Mountains, along the traditional boundary between Hungarian and Romanian cultures. We met Zolti Antal, one of the region's first class fiddlers. Footage from that excursion is intercut with material filmed in 2006 during our final visit to the region. In June 2000 we traveled with Kallós on a five-day research trip. Two years later, with support from a CEC ArtsLink grant, we were able to shoot the bulk of the film, visiting villages in Cluj, Mures, Hargitha and Bacau counties. We documented music played and sung by people Kallós has been supporting for years, both emotionally and financially. Music is a part of daily life for these people. Woven into weddings, funerals and holiday feasts, the songs give voice to their joys and sorrows, their loves and losses. In 2002 the project came to the attention of National Geographic magazine writer Frank Viviano, who accompanied our videotaping expedition as an observer. 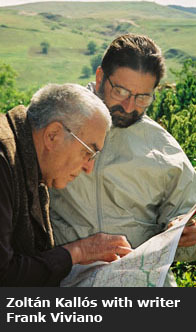 The following year, George Csicsery returned to Transylvania and Moldavia to assist as guide and interpreter for Viviano’s story about the Csángó people of the region. The article appeared in the June 2005 edition of National Geographic. A 2005 grant from National Geographic’s All Roads film initiative provided support for a followup videotaping expedition in 2006, resulting in a closer look at the people and places we had come to know during previous research and production trips. We hope that this film conveys a sense of life’s daily rhythms, and of the subjects and their world as it is reflected in their music and culture. The atmosphere is barely disturbed by occasional factual information. It is our intent to create a film that delivers a feeling about people and place, rather than inundating the audience with information. Transylvania remains a land with a more direct connection to a way of life that has disappeared from every other part of Europe.